This post is sponsored in conjunction with ChristmasCookiesWeek. I received product samples from sponsor companies to aid in the creation of the ChristmasCookiesWeek recipes. All opinions are mine alone. 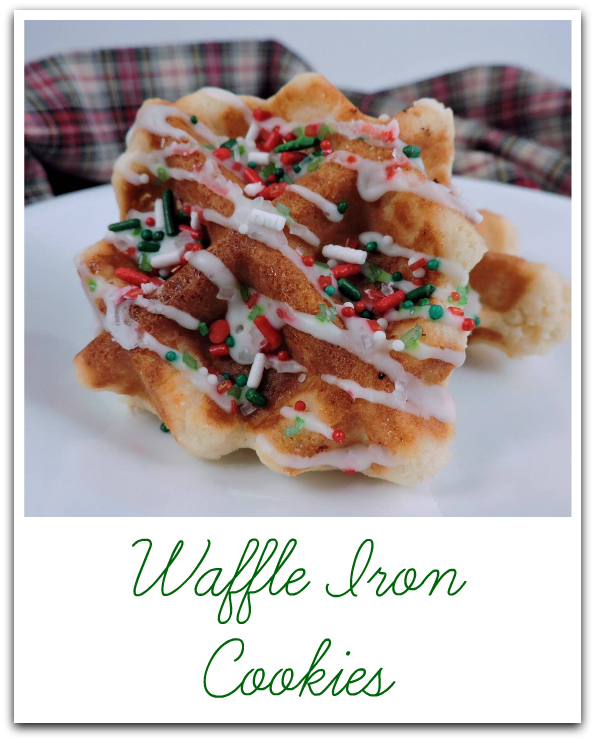 For my third Christmas Cookies Week recipe, I wanted to try a little something different. 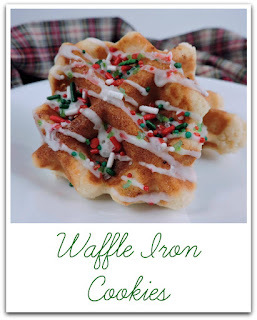 I ran across this recipe for Waffle Iron Cookies from Taste of Home on Pinterest, and they looked so fun to make! Though I own two waffle irons, both of them are considered "Belgian" models. I used the one that seemed more shallow of the two, and just allowed extra time for them to cook. The original recipe called for a dusting of powdered sugar, but I thought I'd make them a little more festive with a glaze and some sprinkles. I love how they collect in the little squares. Since my iron was a little deeper than a regular one, I got 24 cookies from the recipe. They disappeared very, very quickly. Thanks so much to Judy T. for sharing her recipe! Be sure to go and see what the other #ChristmasCookieWeek participants are sharing using the links below. Don't forget to enter the giveaway for your chance to win one of the prize packages from our generous sponsors! Details on the prizes can be found here. In a large bowl, cream butter and sugar until light and fluffy. Beat in eggs and vanilla. In another bowl, whisk flour, baking powder and salt; gradually beat into creamed mixture (mixture will be thick). Drop dough in batches by tablespoonfuls 3-4 in. apart onto a greased preheated waffle iron. Bake 2-3 minutes or until dark brown. Remove to wire racks to cool completely. Combine confectioner's sugar, vanilla and milk together to desired consistency. Drizzle over cookies with a fork. Top with sprinkles. Can't wait to try these recipes! Top 10 Main Dish Recipes of 2018! Top 10 Breakfasts of 2018!